On Monday 30 May 2016, Hetty Paërl – cheerful, versatile, driven and above all modest -, was awarded honorary membership of the UNIMA by the international UNIMA board: a good reason for an interview with this artist. Besides being an illustrator, painter and musician, she is also a writer of a great many books on puppetry. Her specialty is Jan Klaassen and his pedigree across Europe. 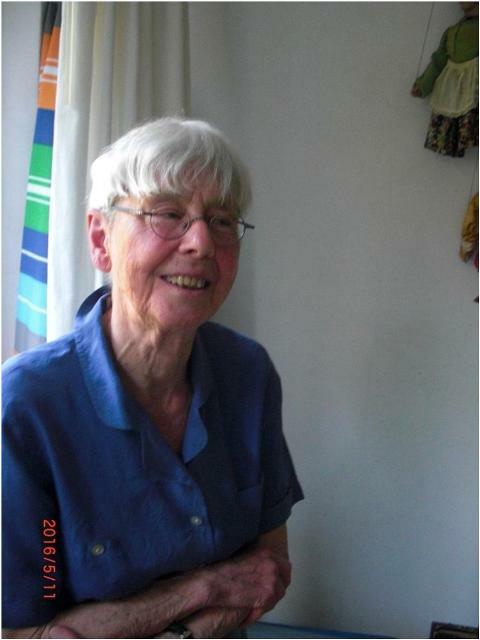 The interview shows Hetty Paërl, born on 16 June 1931 in Wijhe, to be a woman who is fond of laughter, apparently sharing this art of living with Jan Klaassen’s British cousin, Punch: “That’s the way to do it”. ‘I have so much for which to thank the UNIMA. Research into traditional folk puppetry brought me so much, starting with our own Jan Klaassen. From the very beginning, I have followed Wim Kerkhove, who saved the Jan Klaassen puppet play from demise and modernized it. I learned a great deal from him. Otto van der Mieden gave me great assignments and I was allowed to make ample use of his library. I have travelled throughout Europe, constantly meeting excellent puppeteers, who were warm, affectionate characters and passionately told me everything about their profession. They have invariably become true friends and referred me to other puppeteers, literature and museums on puppetry. In part, thanks to scholarships for research, I have been able to write books on puppetry. But what was the story with Jan Klaassen. On the 325th birthday of Punch & Judy, the Italian Pulcinella puppeteer Bruno Leone played in London, alternating with Salvatore Gatto. Salvatore could play the guitar beautifully and sing just as well, and Bruno Leone danced in front of the cabinet in his white Pulcinella outfit with Pulcinella mask. Hetty started dancing along spontaneously. One thing led to another and Bruno invited her to come to Italy for three weeks to attend a six-day folk puppet theatre festival featuring rod puppets in Sicily, as well as the Pulcinella festival, which he organized in Naples. Pulcinella’s is very popular with locals in Naples. Hetty saw street rascals climbing high on the fencing in front of the windows of the theatre, which was filled to the rafters, hoping to be able to still catch a glimpse of the performance. Preferably in English after all? Bruno Leone trained as an architect, but actually wanted to become a puppeteer. He paid the last folk puppeteer, Nunzio Zambella, a visit, who didn’t want anything to do with him. Only after Bruno had learnt to speak with a self-made pivetta (in England: a ‘swazzle’. This is used for the Punch puppet when speaking – it is a metal and cotton tape reed) and after he had successfully given performances for young offenders in prison, did Zambella offer him his own swazzle and teach him the tricks of the trade. Bruno Leone collected a great deal of material and knowledge about the symbolic backgrounds to Pulcinella. When the Berlin Wall was still there, folk puppeteers were given the cold shoulder in Czechoslovakia. Anton Anderle, who was from a family where the profession was passed on from generation to generation, had to call himself an amateur. He was not allowed to perform abroad. Hetty saw him perform in Prague, and she thought it was fabulous! When Hetty heard there would be an international folk puppet festival in Austria, she strongly recommended the organizer to invite Anderle. Anderle was then given permission by his government for the first time! 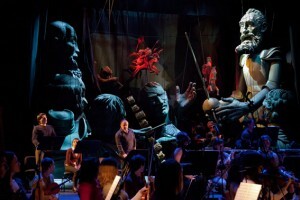 Hetty attended his performance in Austria, and was given his main puppet Gasparko after the performance as a token of gratitude. A year later, Anderle also gave her the Zabinka: Gasparko’s wife. 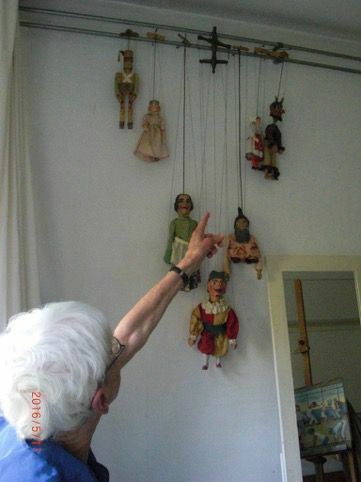 We were able to witness her fond cherishing of these beautiful puppets. 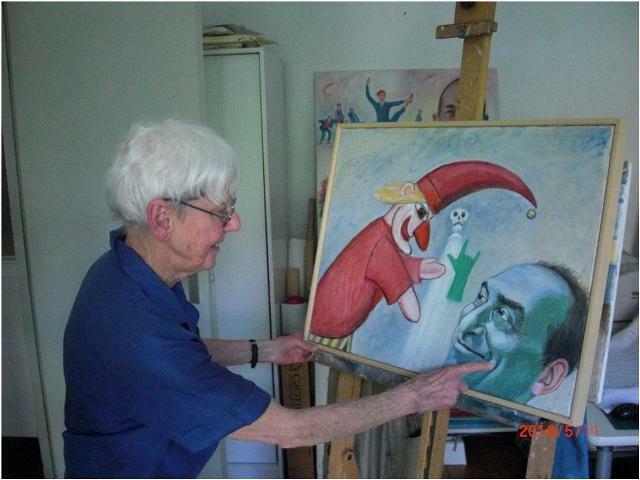 Painting by Hetty Paërl of Wim Kerkhove; puppeteer on the Dam from 1980 – 2000 and organiser of Puppet Theatre on the Dam, which can be watched every Sunday (since 2012). He is also the founder of the Jan Klaassen Academy. ‘Of all main characters from European folk puppet theatre, Punch is the cruellest one. An English puppeteer told me once that Punch represents the hypocrisy of people. Punch shows how we cope with our feelings of discontent, frustration, disappointment and anger. He holds up a distorting mirror to us. Come on, away with that crying baby, out of the theatre with a great swing of Punch’s hand. ‘Paste them behind the wallpaper’, parents used to say when their children bothered them. There is a scene in which Punch takes the baby through the meat grinder; when he subsequently pulls the handle back, the baby appears again, this game is repeated several times. It is the children themselves who often have the most fun. It cannot be violent enough for them. It is play. It is often adults who worry about children’s souls. However, this is the wisdom of life, the art of life; as if everything is a bed of roses in real life. Are we allowed to let off steam for a moment while watching puppet theatre? I love it; it is a breath of fresh air. Last Sunday (Mother’s Day, 8 May) I went to watch Egon Adel from the Puppet Theatre on the Dam. But the fact remains that for some children it is not just a play sometimes, the puppets are real to them. You also notice this when they get to shake your hand after the Jan Klaassen performance. Life, however serious and vulnerable, is a game. That’s the way to do it. Laugh about it. ‘Oh, all those names, I cannot remember them, I am really getting old, I think it is terrible’, Hetty cries out several times during our conversation. But she is still able to convey so much full of passion and fire. Most things are well-documented in her books, it is just a matter of looking it up. It is great what she achieved during her lifetime. 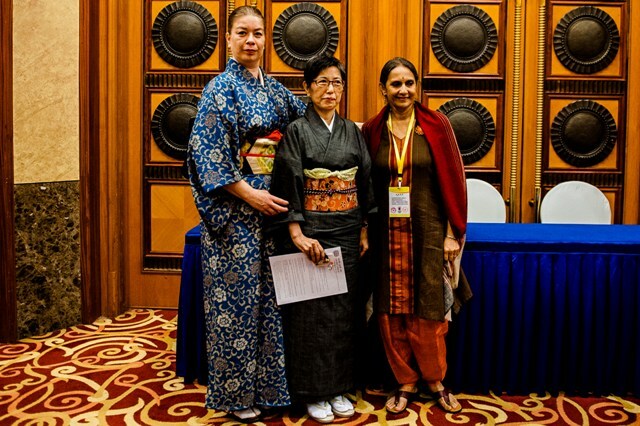 She is rightly nominated for honorary membership of the international UNIMA. Do you want to know more about Hetty Paërl? Her entire oeuvre can be found in the library of the NVP-UNIMA. A great deal of her work can be read in the puppetry museum in Vorchten, such as an interview by Otto van der Mieden on her 80th birthday: ‘Handschriftelijk noteren’ [‘Noting down in handwriting’]. The document, which is available online, also contains a bibliography of her work. The puppetry museum also has a lot of Hetty Paërl’s visual work on display. article published in WP Dutch magazine for puppetry 2016, number three, translated in English in response to Honorary UNIMA member Hetty Paërl, musician,painter, illustrator, researcher of traditional puppetry …. A Dutch expletive. A bastardised curse used by 19th century folk puppeteers when they performed for posh families and had to use decent language.